What is the purpose of a Dome Mirror? Dome Mirrors are used to provide all-round visibility where safety and security is a huge concern. They help to keep a lookout around the immediate location thanks to its maximized angle of visibility. Originally designed to be mounted on the ceiling for a full 360 degrees view, these convex mirrors are also available in shapes that can be fixed on walls and corners. The maximum visibility of this security mirror provides an assurance of what is happening around you. It is also used to provide parking assistance in certain locations where visibility is difficult, and is quite often used as a safety mirror in a car park. Where can a Dome Mirror be used? Curved mirrors such as this product can be used in any location that requires extended visibility. It is particularly helpful in retail locations to assist with asset protection programs, in warehouse locations where higher visibility for staff traffic is needed, in parking locations that are too compact for proper vision, or even in garage area that are hard to see head on. 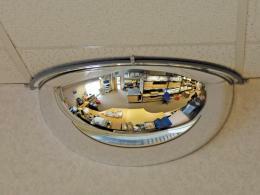 The hemispherical mirrors are also useful for, in offices, or in other public buildings where safety risks are high. 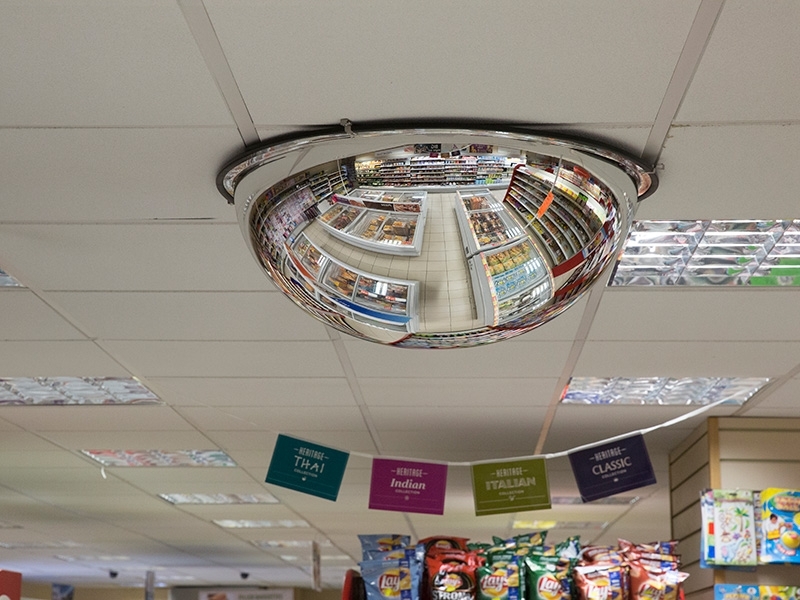 People who own convenience stores can use this mirror instead of paying extra to staff that keeps watch around the store. 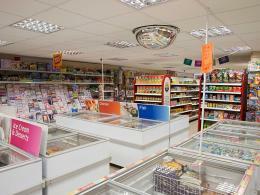 Something as simple as safety mirrors can be a cost effective addition to security measures in a variety of premises. Security personnel can be advised to mount these mirrors in specific places of buildings to secure the environment. Who might use the hemispherical mirror? The mirror should be mounted by a person who is familiar or has been trained to ensure optimal positioning. Personnel tasked with security management in any location will find this a useful tool in their protection efforts. Parking garage maintenance personnel can use this product to ensure the safety of passing vehicles, and in warehouses, forklift operators can utilize the optimal positioning to allow them to ensure the path is clear when making deliveries. In domestic areas, homeowners that have curved driveways or expansive garage spaces benefit from the added visibility. This curved mirror is made of Acrylic molding which is not easily breakable, unlike glass, and yet remains clear. 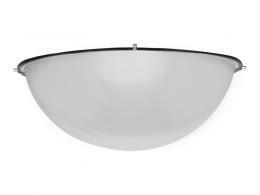 It has a lower weight than industrial mirrors making it much safe in case of breaks, and easy to manage for odd shapes locations.The full hemisphere is manufactured to mount onto a ceiling but can also be suspended vertically as required. For walls and corners, half and quarter hemispheres mirrors have been specially designed which can offer a 180 degrees view, and prove to be excellent blind spot mirrors. The Workplace Depot offers a standard one year warranty on all parts and labor. Our Dome Mirrors fully comply with all local council and government regulative manufacturing requirements to ensure the safety of your customers and staff. Most companies place the advancement of their security measures at the top of their list of priorities right now. Thanks to the rising crime rates, this will hold true for years to come. The addition of the dome mirror has allowed crucial assistance to increasing site security. They are also more affordable than higher end options for cost minded customers.